The Vogler Quartet will bring their award- winning creative interpretations of classical works to Orvis Auditorium on Oct. 13. The Honolulu Chamber Music Series launches next week with the first of six concerts. The 2005-06 concert season runs through April at Orvis Auditorium at the University of Hawaii-Manoa. The series' tradition of informal talks with participating musicians will continue, before or after each concert. Season tickets are $125. Single tickets are $30; $18 students; available three weeks prior to each concert through etickethawaii.com or University of Hawaii ticket outlets (Manoa Campus Center, Rainbowtique and Paliku Theatre). Service charges apply. Tickets may also be purchased at the Orvis box office beginning one hour before curtain. The visiting musicians will also present master classes, lectures and demonstrations in addition to their performances. Vogler Quartet: The East Berlin quartet (Tim Vogler and Frank Reinecke on violin, Stefan Fehlandt on viola and Stephan Forck on violoncello) has developed a reputation for creative interpretations of works by Beethoven, Berg and Debussy, winning several awards in Germany and abroad. The program includes Mozart's "Prussian" Quartet No. 2, Brahms's Quartet in A Minor and Shostakovich's Quintet for Piano and Strings in G Minor. With Ian Parker on piano, 7:30 p.m. Oct. 13. Osiris Piano Trio: Pianist Ellen Corver, violinist Peter Brunt and cellist Larissa Groeneveld are soloists who perform collectively as the Osiris Piano Trio. 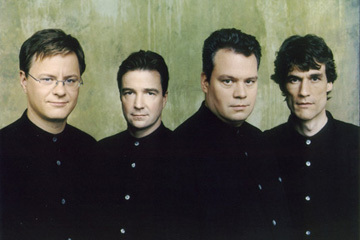 They are known for their repertoire of romantic and classical works and have played Beethoven's "Triple Concert" with orchestras in Europe and South Africa. They also lead master classes. At 4 p.m. Nov. 6. Thomas Meglioranza: The American baritone won the 2005 Walter W. Naumburg Foundation International Vocal Competition for concert repertoire. In past years he has won the Concert Artists Guild International Competition, the Joy in Singing Award and the Franz Schubert and Music of Modernity International Competition. He has said he is equally at home with Monteverdi or Rodgers & Hammerstein. At 7:30 p.m. Dec. 3. Kronos Quartet: The Grammy Award-winning quartet (David Harrington and John Sherba on violin, Hank Dutt on viola and Jeffrey Ziegler on cello) has just released a 25-year retrospective, drawing upon the group's 40 recordings. Kronos' newest project, "You've Stolen My Heart," is a Hollywood-inspired collaboration with singer Asha Bhosle. At 7:30 p.m. Feb. 18. Belcea String Quartet: The Wigmore Hall (London) resident quartet (violinists Corina Belcea and Laura Samuel, violist Krzysztof Chorzelski and cellist Alasdair Tait) has twice been awarded the Chamber Music Award of the Royal Philharmonic Society. At 7:30 p.m. March 3. Brentano String Quartet: The group (Mark Steinberg and Serena Canin on violin, Misha Amory on viola and Nina Maria Lee on cello) became the first quartet-in-residence at Princeton University in 1999, then was named quartet-in-residence at New York University. With cellist Mark Votapek, 7:30 p.m. April 4.